Combine dashi, mirin and soy sauce in a pot and bring to a boil. Cook the udon noodles. Drain and place in individual bowls. Deep fry the ebi tempura until golden brown. Soak up excess oil. 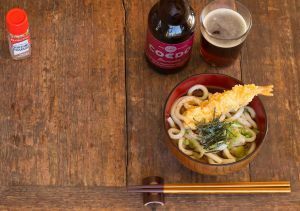 Ladle hot broth over udon noodles, top with crispy ebi tempura. Garnish with chopped scallions and kizami nori. Add shichimi togarashi.